Rail improvements between Belchertown and Amherst in 1853 provided connections to Springfield and Boston, enabling Amherst industry to expand as raw materials and markets became more accessible. The paper mills in North Amherst, the palm leaf hat factory on Dickinson Street, the wire mill in East Village, and the wood-working shops in South Amherst were some of the expanding industries of the period. Textile mills in North Amherst (ca. 1845-1852) played an important economic role, although the mills were destroyed by fire in 1857. The industrial potential of the Mill River was improved when Moore and Ebenezer Dickinson began constructing a canal below the water level around 1813. 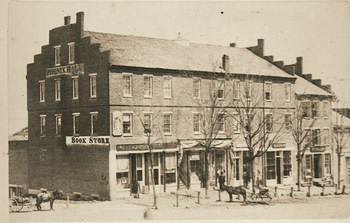 The Amherst Cotton Factory (1819), Dickinson’s cotton factory (1835), Peter Ingrams’ woolen mill (1837), and Dana Wheelock’s woolen mill (1840-1860) contributed to the North Amherst textile industry which shortly languished due to inexperience and poor management. The mills eventually turned from textiles to paper and paper products. Roberts’ mills produced paper products from 1807 until they were destroyed by fire in 1894. The Cushman brothers, with a patented paper-making process, built mills in 1835, 1859, and 1863. By 1865 there were four mills producing papers in North Amherst. In the southern portion of town, the Kelloggville tool factory on Belchertown Road produced bench planes through 1870. Several brickyards in the area were in operation at this time. Baby carriages and children’s wagons, broom handles, shingles and wooden pumps were milled in South Amherst on Middle Street and Bay Road. Farming remained a dominant occupation in both North and South Amherst, although the 1830s silk worm experiment momentarily overshadowed agriculture in South Amherst. Leonard M. Hills of East Amherst, founded the palm leaf hat business which grew into Amherst’s largest industry. Tool making in the small shops of Porter Dickinson and George Burnham on Pelham Road was another East Village industry.